Fresh out of the gate, Cafe Casino is proving they are a powerhouse in the online casino market. Fully licensed and registered with the Kahnawake Gaming Commission located in Canada, Cafe Casino is quickly becoming one of the first stops for American players. Excellent customer service, a wide selection of games and their clean, easy to navigate website are three things that help them rank highly, regardless of how new to the market they are. 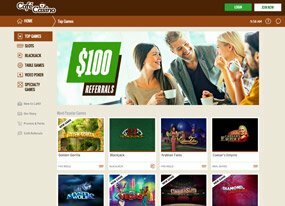 With over 100 games to choose from - a wide variety of slots, table games, specialty games and video poker, players should definitely consider Cafe Casino to be their first choice in online casinos. If you enjoy specialty games like Scratch Cards or Bingo, variations of Blackjack, table games, or slots – Cafe Casino has you covered. The games are ordered by type and have a great instructional page for each game. The instructional pages are great for beginners, they’re detailed and informative, allowing players to familiarize themselves with the rules before they begin playing. Cafe Casino offers a welcome bonus of 500% up to $5000 for all new players. The deposit and bonus amount is subject to a 25x play-through requirement before any of the funds can be withdrawn. They also have a Free Chip bonus, where each player will receive a complimentary $10 chip when they sign up with Cafe Casino – no deposit required. Their Perks program is a fantastic way for bettors to take advantage of promotions and earn Cafe points. Once players deposit for the first time, they are automatically registered for the Perks program, earning them 10% cashback daily, weekly bonuses, entry into draw for up to $4000, Cafe points that can be converted into cash, and the opportunity to earn $100 for each friend they refer to the site. Once a player earns 50,000 Cafe points within a month, players can earn VIP status, which enhances the Perks experience. The one limitation with Cafe Casino is that they have very few deposit and withdrawal options. Visa, Mastercard and Bitcoin are the only options available to bettors. If you don’t possess one of these, luckily there are prepaid credit cards at most convenience stores and gas stations across North America.